Landlord tips on property management, evictions and more. On May 24, 2018, President Trump signed into law a permanent extension of the “Protecting Tenants at Foreclosure Act” (PTFA). The original version of the PTFA, which expired at the end of 2014, enabled renters whose homes were in foreclosure to remain in their homes for at least (1) 90 days or (2) for the term of their lease, whichever is greater. Back in 2009 the PTFA was the only federal protection for renters living in foreclosed properties. During the financial crisis, inappropriate lending, falling home prices, and high unemployment led to a high number of foreclosures across the U.S. The State of California soon followed the PTFA with the passage of its own Homeowners Bill of Rights that also allowed tenants of foreclosed property to stay in the property for at least 90 days after the service of a very specific Post Foreclosure Notice to Quit or for the term of their lease. The new Federal Legislation makes the PTFA a permanent part of the post foreclosure landscape and applies to every state, The PTFA applies in all states but does not override more protective state laws and provides most renters with the right to at least to 90 days’ notice before being required to move after a foreclosure. Before the permanent extension, renters, who often have no idea that their landlords are behind on mortgage payments, could be evicted with just a few days’ notice in most states. Under PTFA, tenants with Section 8 housing choice voucher assistance have additional protections allowing them to retain their Section 8 lease and requiring the successor-in-interest to assume the housing assistance payment contract associated with that lease. The extended PTFA applies to all foreclosures on all residential properties; traditional one-unit single family homes are covered, as are multi-unit properties. The law applies in cases of both judicial and nonjudicial foreclosures. Tenants with lease rights of any kind, including month-to-month leases or leases terminable at will, are protected as long as the tenancy is in effect as of the date of transfer of title at foreclosure. One of the most important parts of the “new” PTFA is that the law places the burden on the person/party who purchases the property at a post foreclosure sale to prove that that tenant who is defending the case is not a bona fide tenant in possession. Under the PTFA and under California law, the immediate successor in interest at foreclosure must: (a) provide bona fide tenants with 90 days’ notice prior to eviction; and, (b) allow bona fide tenants with leases to occupy property until the end of the lease term, except the lease can be terminated on 90 days’ notice if the unit is sold to a purchaser who will occupy the property. A lease or tenancy is bona fide if the tenant is not the mortgagor or the parent, spouse, or child of the mortgagor. Other determinants if it is bona fide is if the lease or tenancy is the result of an arms-length transaction, and the lease or tenancy requires rent that is not substantially lower than fair market rent or that is reduced or subsidized due to a Federal, State, or local subsidy. The law does not cover tenants facing eviction in a non-foreclosed property, tenants with a fraudulent lease, tenants who enter in lease agreements after a foreclosure sale, or homeowners in foreclosure. Additionally, the law does not affect the requirements of any State or local law that provides for longer time periods or extends additional protections to tenants. In California, an important decision deciding some of these issues under the original PTFA was Nativi v. Deutsche Bank National Trust Company, 223 Cal. App. 4th 261 (2014). The appellate court reversed a trial court decision denying relief to tenants under the PTFA. 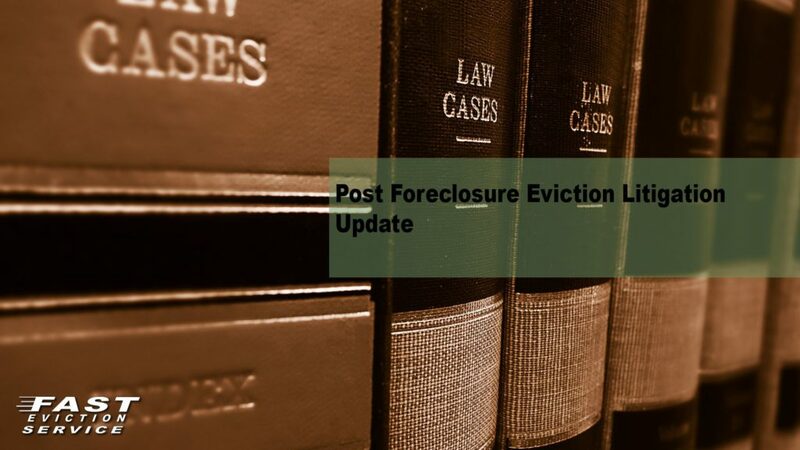 The appeals court held that the PTFA causes a bona fide lease to survive through the end of the lease term after a foreclosure with very limited exceptions. The decision explained that the PTFA impliedly overrides state laws that provide less protection but expressly allows states to retain the authority to enact greater protections; and permitted enforcement of the PTFA in litigation under state law claims. The following are the steps necessary for a successful post foreclosure Unlawful Detainer case for a party who acquires real property at a Trustee Sale: (1) record the Trustee’s Deed Upon Sale as soon as it is received but in no case more than 15 days after the sale; (2) provide the occupants with a Notice of Change of ownership and information of how to located the new owner; (3) prepare and serve a 3/90 Day Post-Foreclosure Notice to Quit using the cover sheet authorized under California; (4) attempt to determine who is occupying the foreclosed property, if you determine it is a former owner then file the post foreclosure Unlawful Detainer action 3 days after the expiration of the notice. However, if you determine that the person(s) occupying the rental property is a bona fide tenant you must wait 90 days after the expiration of the Notice to begin you Unlawful Detainer case; (5) obtain the pre-foreclosure chain of title including the Deed of Trust, any and all assignments of the Deed of Trust, any and all substitutions of trustee, the Notice of Sale, and a certified copy of the Trustee’s Deed Upon Sale; (5) before setting the matter for trial it is advisable to send out Form Interrogatories, Special Interrogatories, Request for Admissions and Request for Production of Documents to the Defendants to determine who is living in the rental property; and (6) prepare for trial by reviewing all of the recorded documents. It is important to note that a bona fide tenant who has not received a proper 90 Day Notice can file a Motion to Quash and/or a Demurrer to delay the prosecution of the case. If either of those two motions are granted it can cause significant delays in getting the tenant removed from the property. Finally, it should also be noted that there are two cases pending before the California Supreme Court that may change when the Post-Foreclosure Notice can be served. One case states it is valid to immediately serve the 3/90 Notice on the occupants upon the sale of the property. The second case states that the purchaser must wait until the Deed passing title to the purchaser at the foreclosure sale has been recorded before the purchaser can serve the notice. Litigating post foreclosure eviction cases are becoming more difficult and much more technical. That is why it is very important to obtain certified copies of the pre-foreclosure title documents, such as the Deed of Trust, any and all assignments of the Deed of Trust, any and all Notice of Substitution of Trustees, the Notice of Default, Notice of Sale and Trustee’s Deed Upon Sale to provide the court with a complete chain of title. At Fast Eviction Service, help on any of the issues discussed in this article is simply a click or phone call away. Email intake@fastevict.com or call our office at (800) 686-8686 to discuss your questions for a free evaluation of your case. Standing: Who Has The Right To File An Eviction Lawsuit?